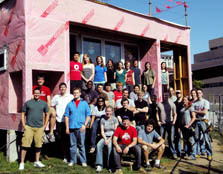 The Ohio State University Solar Decathlon 2009 team in front of their house. Ohio State's "Ohio-centric" solar house features local materials, local appliances, and a façade of reclaimed barn wood to honor the heritage of the state. A famous quote by Woody Hayes, the legendary and long-time coach of the Ohio State University football team, is quite simple: "You win with people." None of the students on the Ohio State Solar Decathlon team ever met Coach Hayes, but they have taken his words to heart by applying hard work and dedication to create a team, a house, and a message that honors the land and people of Ohio. The team itself is a dedicated and enthusiastic group of 60 undergraduate and graduate students from 19 majors. Faculty co-advisor Mark Walter is proud of the team's student focus and points out that every aspect of the project, including the construction, has been done by students. The layout features an open interior space, a "blank canvas" that transforms from kitchen to dining room to entertainment room to bedroom as needed. An operable rain screen, part of the house façade, and louver window shades on the southern façade allow occupants to admit sun and heat into the house in winter or shade the interior space in summer. Photovoltaic (PV) panels are mounted on adjustable racks to make the most of solar resources. The adjustable design allows the team to optimize the angle of the panels for any location—be it Columbus, Ohio, or Washington, D.C.
For heating and cooling, the design relies primarily on passive design, including an orientation that makes the most of natural ventilation and daylighting strategies, triple-paned windows, and a "second skin" made of reclaimed wood that insulates and shades the home. When additional heating or cooling is needed, three split-system heat pumps, which use preheated or cooled air from a heat recovery system, are available. In spring and fall, when less cooling is needed, only one system needs to operate. During summer, all systems can be used to maintain comfort. A multiple-heat-pump system that uses preheated or cooled air from a heat recovery system.